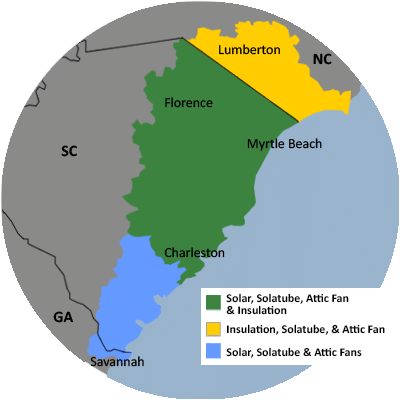 Spray Foam Insulation in South Carolina & North Carolina - What's Your Choice? Most homeowners understand that improving home insulation is a surefire way to cut the cost of heating and cooling, and that's where spray foam comes in. While homeowners consume spray foam in the form of small pressurized cans available at home centers and hardware stores, foam insulation contractors are busy doing large-scale spray foam operations —filling the spaces between studs, joists and rafters with the insulation that expands on contact. Contact us today for a Free Quote for spray foam insulation in Myrtle Beach, Charleston, Sumter, and nearby areas including Bluffton, Florence, Mount Pleasant, North Charleston, Darlington, Beaufort, Goose Creek, and more. Carolina Energy Conservation can inspect and evaluate insulation and airtightness levels at your house and provide the right energy-saving solutions. Call or email for a free evaluation and insulation quote today. Call 1-855-410-0662 or contact us online to schedule a Free Quote for spray foam insulation in Sumter, Charleston, Myrtle Beach, Mount Pleasant, Florence, Bluffton, Darlington, Beaufort, Goose Creek, North Charleston, and the surrounding areas.